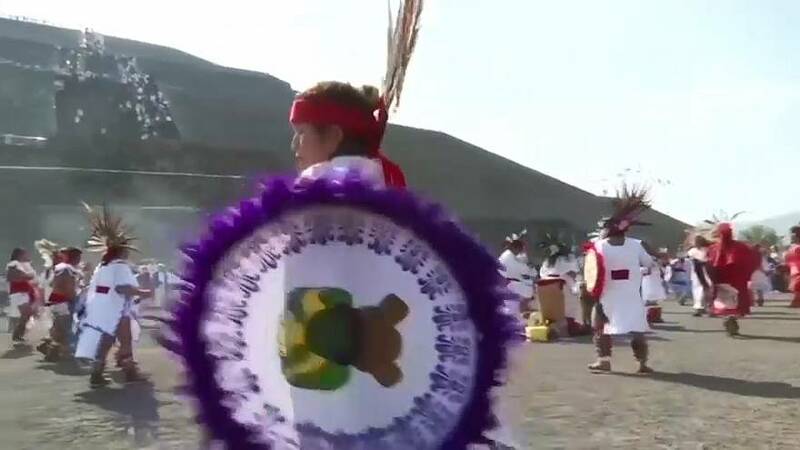 Hundreds of people climbed Mexico's towering Pyramid of the Sun to celebrate the spring equinox on Wednesday. Some believe the pyramids hold a special energy on the equinox that can be transmitted to people and pilgrims wear white in a bid to better absorb this positive force. The pyramids are located in Teotihuacan, a sprawling pre-Hispanic ghost town 50 kilometres north of Mexico City. People from across the country and abroad make an annual pilgrimage to the ruins to celebrate the first day of spring, climbing its tallest structure, the Pyramid of the Sun, and throwing their arms skyward. Luis Medina Morales, 80, said: "It's the beginning of spring. We believe the sun radiates energy, and all those who are dressed in white get that energy charge and they leave happy because in some way [the sun] gives us that benefit." Fellow pilgrim Graciela Cruz Garcia said: "It's great to come and leave all the bad vibes and take good things home and to the family." Teotihuacan emerged about two centuries before the birth of Christ and was home to as many as 200,000 people at its peak. The pyramids once formed part of a city the size of ancient Athens or Rome, which served as the primary centre of learning in the Americas for over a millennium, but the city declined around 650 BC and was almost completely abandoned by 750 BC for reasons still unknown.